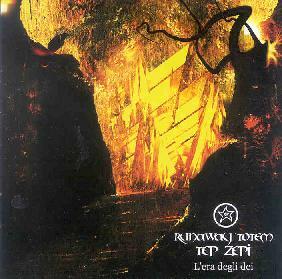 Runaway Totem - "Tep Zepi"
Italian, opera vocals, weird musician names, very proggy. Does this sound interesting to you? I think that nobody does weird prog better than the Italians. What we have here is very intense, very edgy music, broken up in places with deep powerful operatic vocals. The band consists of CAHÅL DE BÊTÊL (vocals, guitars), VîRHÜR (keys, sampler), TIPHERET (drums), NEZAH (bass) with Susanna Villanova (vocals). The instrumentation is pretty sparse, with the guitar carrying most of the leads. The keys add lots of background riffing and atmospherics. The bass and drums add a nice solid groove to it all. It’s a bit of modern prog, kind of heavy at times. The playing is uniformly good and the vocals are pretty amazing. The mix feels like the bass has been muted a bit, while the treble has been brought up a little, giving it a kind of sparse sound. Very Italian. If you are a fan of the intense Italian sound, you will really like this. For more information you can visit the Runaway Totem web site at: http://www.runawaytotem.com. Tep Zepi is distributed by Musea Records. You can visit their web site at: http://www.musearecords.com.